Iranian multi-instrumentalist Sahba Sizdahkhani serves as a unique crossroad of East meets West. Inspired heavily by 1960’s free-jazz and Persian Traditional Music, he constantly channels the fire-energy and longing for connectivity that these two stormy histories represent. Sahba has recorded with artists on the imprints of Dischord Records, Southern Lord, and Drag City, and has appeared live with Peter Brotzmann, Devendra Banhart, Miho Hatori (Cibo Matto), Marc Ribot, Eli Keszler, and Mary Halvorson. He completed a Bachelor of Arts at The University of Maryland in Art History and Archeology as well as in Jazz Performance at Berklee College of Music. 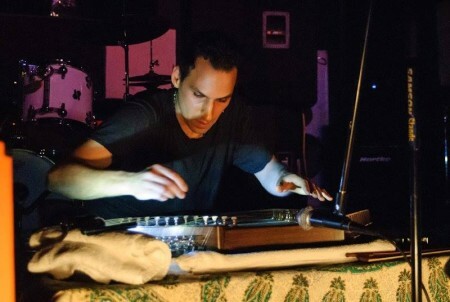 For this performance of 104-string santour and percussion, he will be channeling slow, long-form compositions coupled with primeval pulse-rhythms, based on the ancient spiritual ceremony of Sama: a ritual used by the Persian Sufi Dervishes to achieve a state of spiritual trance and numbness. Recent studies of the Sufis by scientists have found that, while under the influence of these rhythms, the chemistry of the brain changes causing a shift from anger to sadness to kindness to joy. Ivan Arteaga is a Seattle-based saxophonist and composer performing a new solo for alto saxophone, body & space entitled Stings & Pulleys. Choreographer Allison Burke is a Seattle-based movement artist who helped develop the piece. Being on a stage is inherently theatrical and this work takes advantage of that. It uses the body and performance space as theatrical elements with which to infuse experimental solo playing.